For routing tilt rod relief in rail. Hand wheels adjust in or out to accommodate rail length up to 40" while maintaining center at all times. Backstop is adjustable for length of cut. 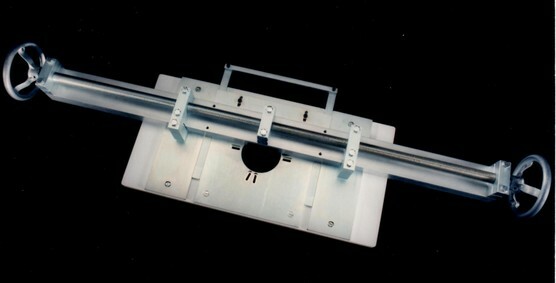 RT-1 should be mounted on customer furnished bench or framework along with customer furnished router. Optional vacuum cover to fit 3" hose available (not shown).